You are a Google Street View employee who is paid to wear one of these on your back and walk around Japan. Your life is sweet. 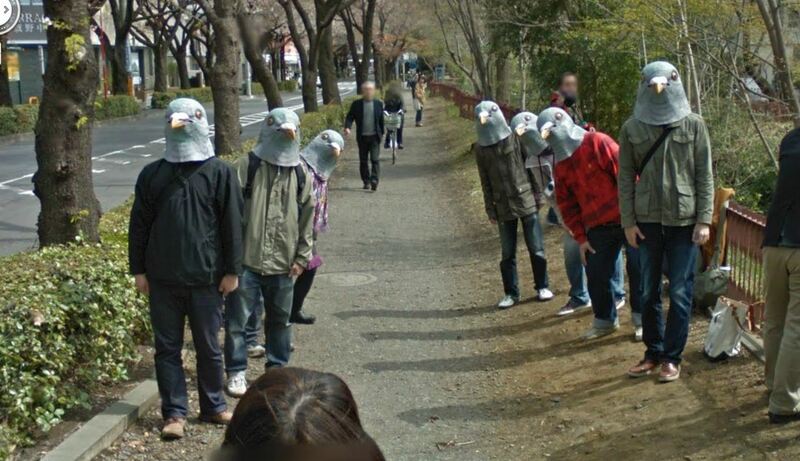 One day, you see these awesome people wearing pigeon head masks on a Tokyo sidewalk. Your life gets exponentially sweeter, because -- despite whether this scene was set up or not -- you're about to embed an Easter egg in a utility for all the Web to see. You document the scene, then wait. On June 21, someone on Reddit pulls up the coordinates and cashes in the karma. The stunt draws favorable comparisons to /r/birdswitharms. Your badassery goes viral. Although this screen grab is pretty great, playing around with the actual view is even better. Users can see the pigeonheads from different angles, including several clicks away. Slate ran an image of the Pigeonheads last Friday but didn't really know what to make of it. "Were they on their way to some obscure Tokyo pigeon festival?" wrote staff writer Will Oremus.